Landers Frary & Clark No. 20 Coffee Grinder or Mill This is one of the best upright mills that I've had in a long time. There are no chips, cracks or breaks in the cast iron and the wooden handle is also in like new condition. The original paint is still about 95% intact with the majority of loss on the gold trim that is on the outer part of the wheels (but even that is still in good shape). The original "Universal" decal is still present and in great shape. I have taken this mill completely apart and cleaned all parts both internal and external thoroughly. The interior grinder parts and axle were wire brushed down to bare metal and the exterior and interior painted parts were cleaned with a toothbrush so as not to disturb the paint. I tested it after I was done cleaning and it will grind coffee down to almost a powder if you wish. The only flaw I can see is a partial split in the original wooden base, but it is stable and has probably been like that for many years. The base of the mill above the drawer is embossed LF&C New Britain, Conn. U.S.A. and the wheels are embossed Landers Frary & Clark New Britain, Conn. U.S.A.. The back of the mill above the hinge is embossed "Oil The Balls". Height 12.5" (with wood base) Wheel Diameter 8.75" Weight 11 lbs. Enterprise No. 1 Coffee Grinder or Mill This Enterprise No. 1 Coffee Grinder or Mill was a rusty mess when I got it with almost no original finish left so it was sandblasted down to bare metal and repainted in a semi-gloss black enamel. The interior parts were wire brushed to the same condition they were in when it was new. It is fully functional and all original parts are present. I forgot to take a picture of the lid in the forward position but it swings forward to load the beans as it should and is in great original condition. The base is embossed "Enterprise Mfg. Co. Philadelphia U.S.A. Pat. Oct. 21.73". Height 11.5" Weight 10 lbs. Enterprise No. 7 Coffee Grinder or Mill This Enterprise No. 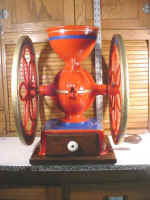 7 coffee mill was manufactured prior to 1881. 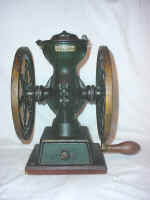 After 1881, all of the mills produced by Enterprise had covers, but this grinder never had one. When I got this mill it had already been sandblasted and painted. It has been repainted in more appropriate colors with blue and gold leaf highlighting the wheels and lettering. It has over 15 inch wheels and weighs in at almost 50 pounds. This mill would look great in a Coffee Shop or even in a large kitchen used as a centerpiece. It has been thoroughly cleaned, works very well and grinds very quickly. The only problems to report are that one of the "wings" on the wing nut has been broken off and the bottom of the drawer has some wood missing near the front. I have decided that I really don't want to take a chance shipping this as it is so large and breakable. I will deliver this item for free within a 50 mile radius of Concord, NH. or it may also be picked up. Height 17.75" Wheel Diameter 15.5" Weight approx. 50 lbs. Manufactured through the late 60's by the Wrightsville Hardware Co. 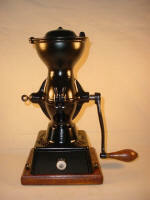 This is the last double-wheel coffee mill made in the United States. 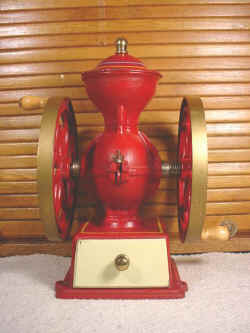 The wheels are embossed with "John Wright, Inc. Wrightsville, PA. Coffee Mill". There is a small dent on the upper left corner of the wooden drawer where it appears to have been dropped. the paint is in very good original condition. Height 11" Wheel Diameter 6.75" Weight 12 lbs. These rare hand wrought mills are attributed to Jonathan Barnes, an iron founder who worked in New England around 1750. This mill is in "as found" condition, meaning that I have done nothing other than to dust it off. This mill differs from most in that they are usually found with only a mounting post attached. Somewhere along the line an addition was made to this mill that allowed a drawer (which was not present) to be inserted and thus catch the ground coffee. This could well be the earliest American made mill to use a drawer for that purpose. The mill is in very good original condition overall. There is a screw on the left side that was used to adjust the grind. The grinder itself rotates freely but the wooden handle does not rotate on it's shaft (I don't believe it was supposed to). The wooden handle appears to have some insect damage on one side and the top piece of wood that the dispensing spout goes through has sprung up somewhat on the right hand side. There a missing nut on one of the mounting bolts. There are original hand wrought square nails used throughout with large nails going through the main mounting board. The longest one of the mounting boards is approximately 14" long and the hopper is about 4 1/2" across. Although it would work, I do not recommend using this mill to grind your beans at home due to it's historic significance (George Washington had a similar mill at Mt. Vernon). This wall mount mill was manufactured by Landers Frary and Clark in New Britain Conn. sometime around the turn of the last century. It is in very good original condition with the original label being around 95% intact. It has a replacement catch cup that is a very good copy of an original that was painted to closely match the original paint on the body. The only things to report are some minor paint loss and extra paint mostly where grandpa slopped it on the mounting brackets when painting the wall. It was disassembled, cleaned and the interior parts were wire brushed to like new condition so it's ready to hang and use. This is a No. 01 Crown table or shelf mounted coffee grinder or mill that was manufactured by Landers Frary and Clark in New Britain Conn. sometime around 1900. It has most of it's original finish still present with some bumps and bruises in the paint. It has it's original decal on the front which reads "Crown Coffee Mill Made by Landers Frary and Clark New Britain Conn". It was disassembled, cleaned, and the grinding gears and bare metal parts were wire brushed to like new condition so it's ready to use. This table mount mill was manufactured by Landers Frary and Clark just after the turn of the century. It features a cast iron body and a sheet metal hopper. It is in very good original condition with the original label being almost 100% intact. The only thing to report are some minor dents and paint chips around the rim of the hopper. It was disassembled, cleaned and the interior parts were wire brushed to like new condition so it's ready to use. This table or bench mount mill was manufactured by Landers Frary and Clark right around 1910. It is in very good condition with a cast iron body and a sheet metal hopper. It has it's original label which is about 80% intact and most of it's original finish. About the only thing to report is some minor dents and chipping around the hopper. It was disassembled, cleaned and the interior parts were wire brushed to like new condition so it's ready to use. This mill was manufactured in Southington, Connecticut by the Peck, Stow & Wilcox Co. sometime between 1875 and 1910. It has a sheet metal hopper and cast iron body that retains most of it's original Japanned finish. It also retains it's original medallion and the original backboard which was repainted somewhere along the line. The backboard does have a split on the right side that extends to the hole for the grind adjust bracket but will be stabilized when the three mounting holes are used. The interior was wire brushed and the exterior was cleaned so it's ready to use if you wish.